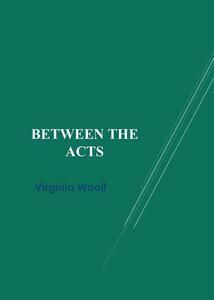 Between the Acts is the final novel by Virginia Woolf, published in 1941 shortly after her death. This is a book laden with hidden meaning and allusion. It describes the mounting, performance, and audience of a festival play (hence the title) in a small English village just before the outbreak of the Second World War. Much of it looks forward to the war, with veiled allusions to connection with the continent by flight, swallows representing aircraft, and plunging into darkness. The pageant is a play within a play, representing a rather cynical view of English history. Woolf links together many different threads and ideas - a particularly interesting technique being the use of rhyme words to suggest hidden meanings. Relationships between the characters and aspects of their personalities are explored. The English village bonds throughout the play through their differences and similarities.